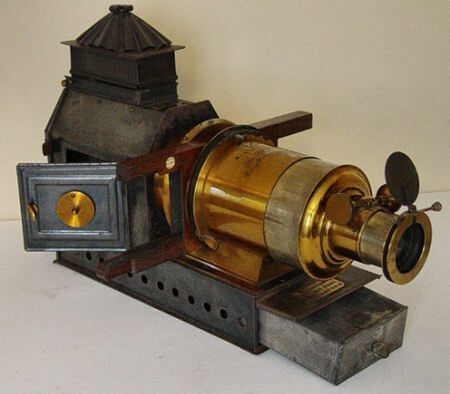 This magic lantern was retailed by the London Stereoscopic Company whose ivory name plate appears on one of the side panels. 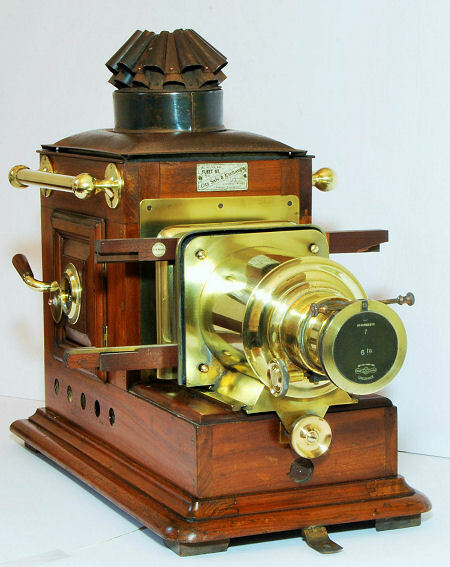 The London Stereoscopic Company was founded in 1854 by George Swan Nottage who was later to become the Lord Mayor of London. 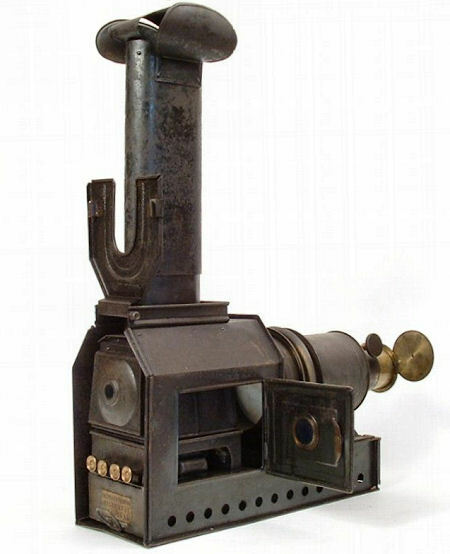 This company produced and sold stereoscopic pictures, stereoscopes and magic lanterns. 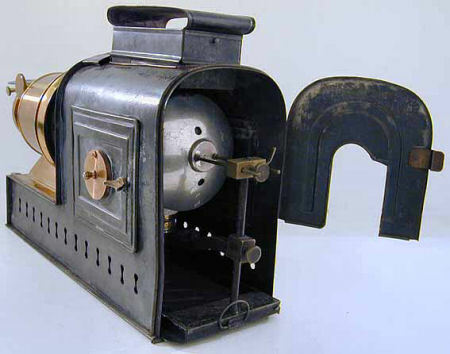 The lantern, which dates to circa 1870, measures 18” (46 cm) long. 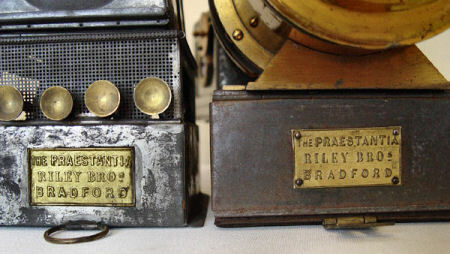 'The Praestantia', made by Riley Bros, Bradford. 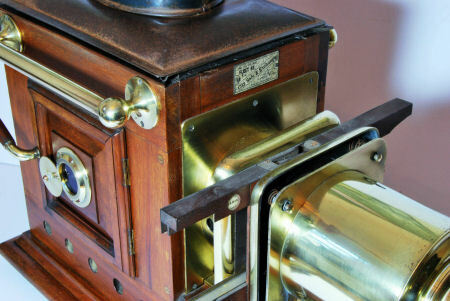 The lantern contains a four-wick paraffin burner; the paraffin reservoir with a brass screw cap is stored behind a hinged door at the front of the lantern. Dimensions: length: 16.5" (42 cm), height: 13.5" (34 cm). A page from their 1898 Magic Lantern & Stereopticon Hire List. The business ran a very successful slide hire operation, carrying a vast stock of slides from all the major manufacturers. 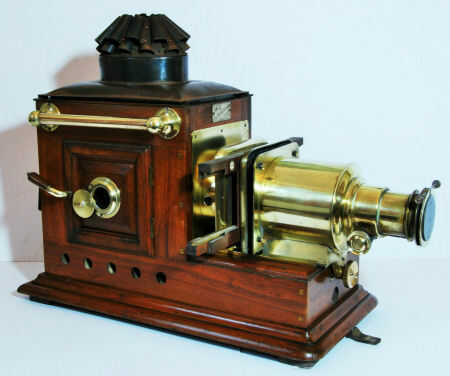 Their 32 page "Hire List of Magic Lanterns, Stereopticons Animated Picture Machines, Slides, and all accessories for Optical Lantern Work." gives the rental prices, lists of slides, dissolving effects for single lanterns, 11 pages of lanterns with illustrations, accessories, window bills, and testimonials. 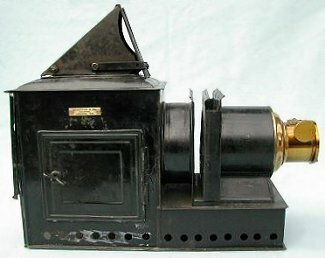 An English magic lantern, made by Sandham & Co., Blackburn, England .The makers name is pressed on plates on the top and side of the body and is also engraved on the hinged lens cap. 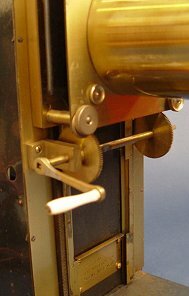 The lacquered brass lens mechanism telescopes to focus with rack and pinion fine adjustment. 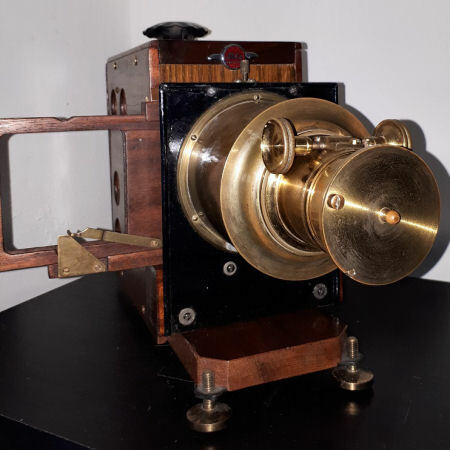 Mahogany and brass magic lantern made by the renowned optician and camera maker J. Lancaster and Son, Birmingham, England. 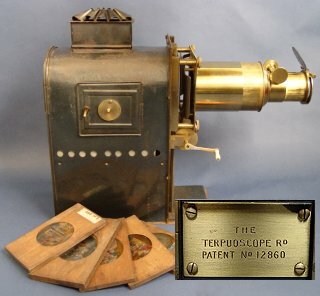 The Terpuoscope, made by J. Wrench ca 1900. 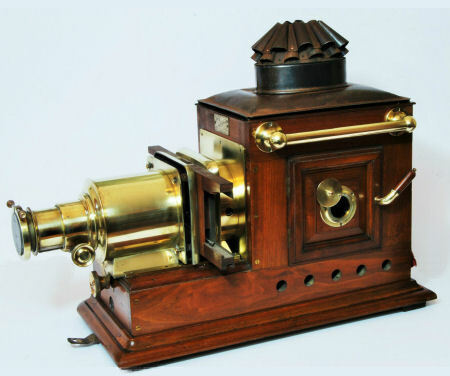 This special form of magic lantern has a vertical slide-carrier, designed to automatically register the slides by means of springs, and a rolling curtain effect, working by a rack-and-pinion system operated by a removable brass lever with a bone handle. The brass curtain rolls up and down when the slides are changed. 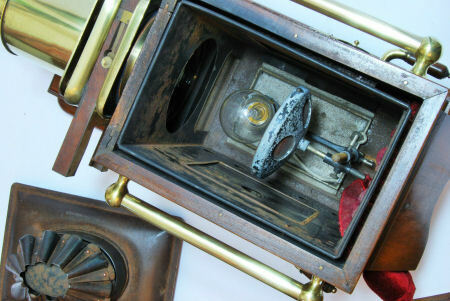 The body of the lantern has a door on each side with brass fittings and blue glass windows. The doors open to allow access to the upper chamber which contains the lamp and the condenser. 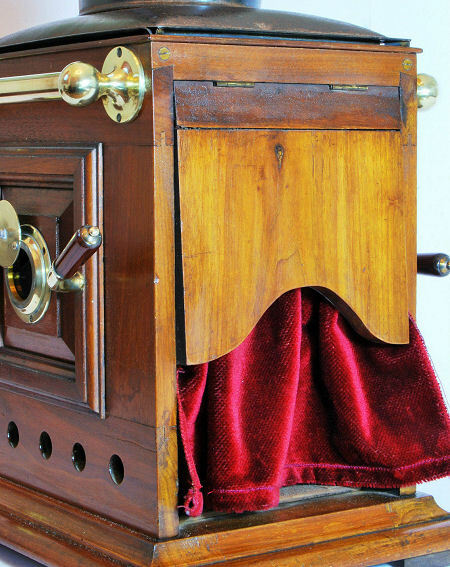 The lower compartment of the lantern may be used to store the chimney and some wooden slides. There is also a compartment that contains a standard size double slide holder. 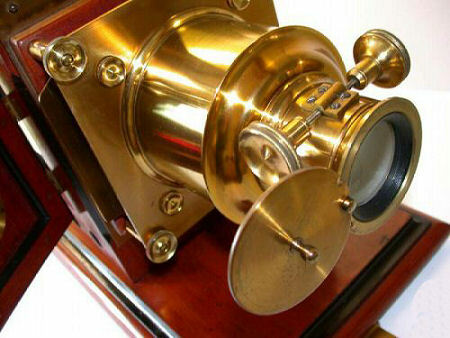 The front of the lantern is completely made of lacquered brass with a removable rack-and-pinion controlled 7 inch lens. 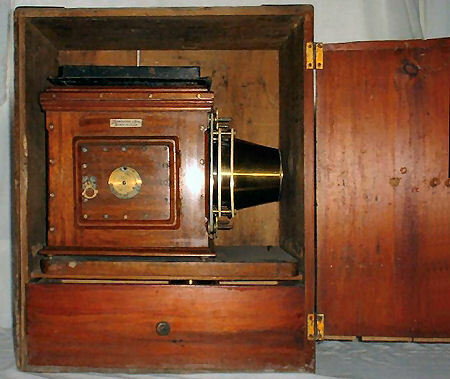 Photographs show the Russian iron model; a mahogany body model was also available. 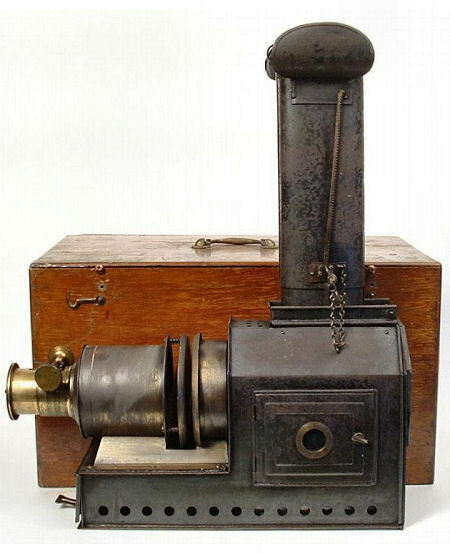 This attractive old black metal magic lantern carries a small white plate with the name of 'Benetfink of Cheapside, London E.C',. 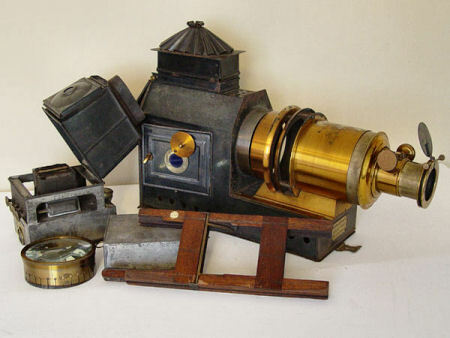 Benetfink was a London retailer of photographic and lantern equipment, as well as non photographic items. 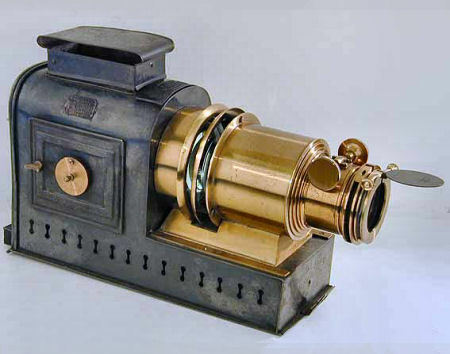 The lacquered brass lens has a brass cover and is adjustable by a rack-and-pinion mechanism. The chimney is probably not original. Complete with its black metal carrying case, circa 6 x 14 x 9 inches (15.5 x 35.5 x 23 cm). 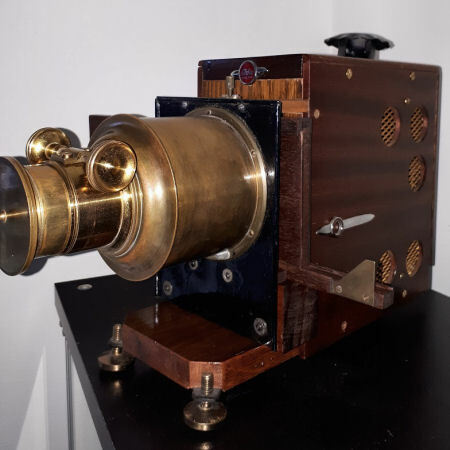 A very handsome and quite substantial late 19th Century mahogany and brass magic lantern complete with 6" brass lens and original slide carrier. 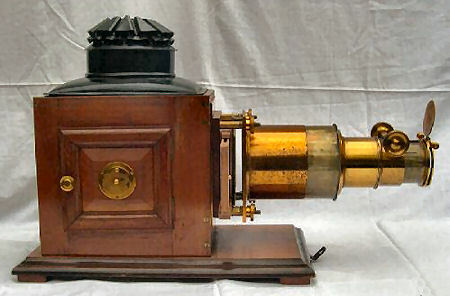 The lens is marked with its focal length, the maker’s trademark (Wrench), serial number and the words ‘London Made’ and ‘Established 1816’. 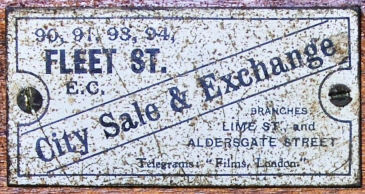 The lantern itself has the retailer’s plate, City Sale and Exchange of Fleet Street in London. 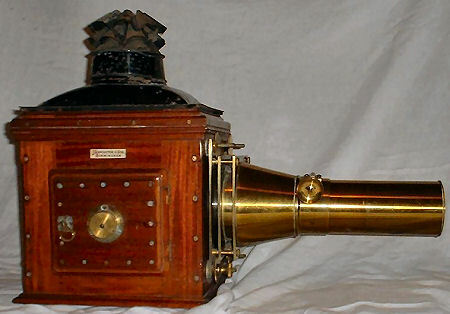 Approximately 56 cm long, 45 cm high. 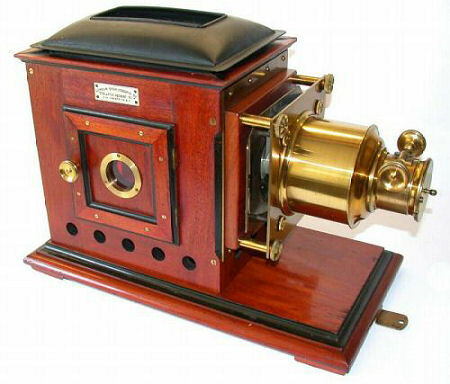 Very nice wooden magic lantern with an equally beautifully executed slide changer. 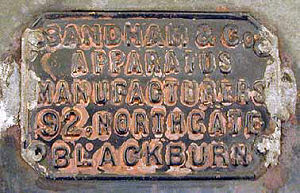 At the front a propeller-shaped nameplate with the name 'Aldis England' is attached. This is probably the manufacturer.